Designing an attractive Logo is incredibly uncomplicated until, or unless accurate techniques are practiced. It only requires suitable directions to nail a perfect looking logo. In old days, designing a well designed Logo was a dream of an ordinary blogger, but now days it seems as simple as learning ABC. Logo adds color to our blog in other words we can say that, it is the best ingredient to magnetize more and more potential visitors. Don’t believe me see the facts, logically when a visitor lands on our site, he gave first priority to our blog’s outlook. This is the reason why today we will design a Professional logo for our blog which will add more colors to our blogs outlook. In this tutorial, we will be learning every thing about logo designing from starting till the end. So I encourage you to open up your Photoshop (No matter what version you are using) and follow the same steps, it will help you to learn more convincingly if your give importance to practicing, then reading. About 2 years back, when I started playing with Adobe Photoshop I was unaware of its features. Being a teenager I though it’s useless. But after viewing back to back video tutorials on YouTube, it started to increase my interest in designing and within few months designing become trouble-free with Photoshop. When we explore enormous world of the internet, we discover millions of software specifically build for designing. But when we compare Photoshop’s features with other software it seems pretty obvious, that there are no two opinions about Photoshop’s perfection. Before you get started, it’s important to first collect the most desirable information about your logo. Mostly only four questions are raised to craft a stunning logo. Color Scheme: Relating your Blog Theme. Simple enough, now we know what exactly we need to do. Now a new window will popped out, asking you to select width and height. We will simply take 600px as width and 500px as height. Before starting its necessary, we do some experimentation with our fonts to provide perfect experience. Experimenting has enormous significance when it comes to skill a certain thing with perfection. Fonts are the basic structure of our logo, and so we should pay our full concentration in selecting most prominent fonts, which attracts the eyes of our visitors. We need to expand a quality in our self to detect whether this font is good or poor. 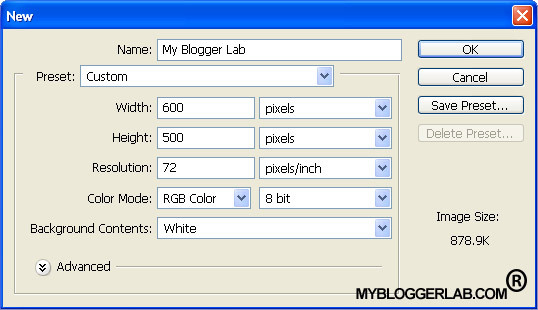 Since for MyBloggerLab.com we are focusing on technology, so selecting a tough font may go in our favor. So to get most desirable fonts go to Dafonts.com, and get access to thousands of font’s related to different categories. As I have mentioned before, selecting a wonderful font is most critical part of logo designing. This is the motive why we taking example of few fonts which are of high-quality, and which lacks quality. The first font in the picture seems immature furthermore it looks like a junky font, which should be avoided. The second font in the representation gives us the perspective of an old school. In fact it is complicated to read, and lacks professionalism. Third font looks awkward, pretty much all over the place. The styling of forth font seems to be Ok, but look wise it’s not that much great. Fifth font again same thing lacks professionalism and even it’s really difficult to read anything. All the logos except the last one are pretty much similar. Logo 1,2,3,4 has bolded structure which makes them ideal in look wise. Logo number 4 is bit serious then other this is the reason why it is most professional in-term of looks. 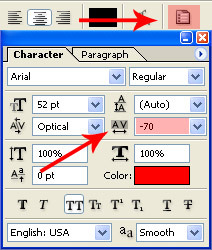 Now you know which font we need to select, remember to select those fonts which can be easily readable by visitors without any efforts. 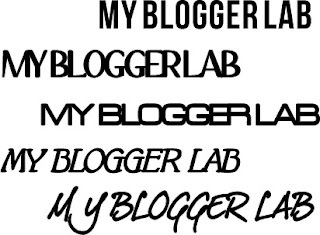 We can use multiple font styles within one logo, since for current project we have three words “My Blogger Lab” so we can either use three or two fonts to stylize or logo’s look. After combining few fonts see the following result. Now our logo is started to take some shape but some this is missing. To add more spice and color to it, we will insert an image which will represent our identity. So in-order to get images we will use images.google.com and search for most prominent image related to our logo. Now after Going to Google Image, simply search for the category of your logo. For example, if your logo is related to technology then search Technology Logo Vector as same goes for entertainment Logo Vector. Remember: it’s important to include Logo Vector after your logo category to get most desirable image. Now once you find attractive images copy it and paste it in Photoshop. 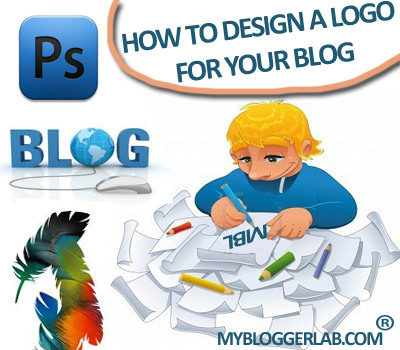 Now arrange it accordingly and your stunning blog logo is ready. So, Guys if we keep it simple we can achive any thing in this world. All we need to do is to promote hard work and success will be knocking our doors. 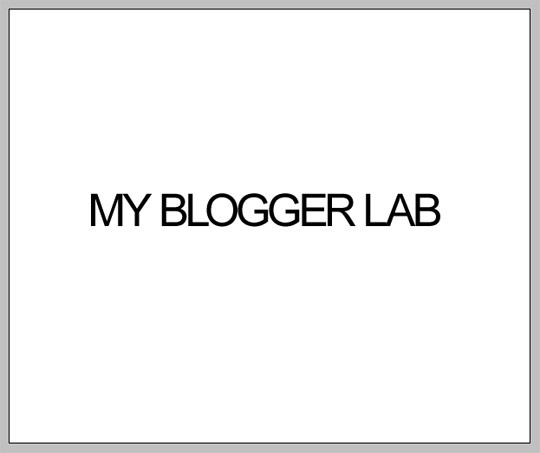 After this tutorial, I hope you all will be able to create stunning blog logo, do some experiments. But if you need my assistance feel free to ask till then Peace, Blessing and Happy Designing. Awesome tutorial Faizan it's really helpful for blogger designers and Newbie bloggers.thanks for the sharing..
what a tutorial..amzing iam searching for this from a long time and finally got it.I am waiting another post of this series. Faizan bro i want your help as you had helped me before also.I want to automatically insert read more or jump break in my post as i publish.I have to insert manually it from blogger,it takes time and waste my time. I had tried many of codes from internet but none of these worked.I want the code so that it autometically forms the read more link. Also i am using the same template as yours. Thanks Brother, For Liking Our Efforts. And Surly Coming Up Tutorials Will Make the Difference. And Will Turn You into a Pro Logo Designer. Thanks Buddy, Well When I Visited your Blog I Am Able to See 2 Read More Links Per Post. I Think You are Using Different Browser This is the Reason why You have To add it manually, Check your Logo in Chrome. However, I Would Love to Help you Pal Just Contact me Via Contact.mybloggerlab.com and We Will continue your problem Privately Peace and Blessings. Thanks For Your Suggestions, Yes Photoshop is always some thing new for blogger this is the reason why we try our best to keep it simple. But To make a Logo Appear professional we need to include some creativity so that's what we did in our logo designing. Well, its the beginning we will surly look forward to your suggestions. Peace and Blessings. hi syed faizan ali..my name is sunil..can you creat a logo for my blog according to its look and name ... if you do this i'am very thank ful to you..
please do it for me.. When we use logo vector from google, if that image was a copyrighted then what will we do?? ?